Riding a five-game winning streak, the 67’s hit the ice Wednesday night for a rare weekday tilt with the Kingston Frontenacs. 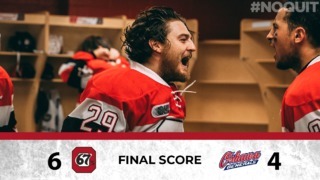 On the heels of another winning weekend where the Barber Poles defeated tough opponents in Oshawa (twice) and Saginaw, the 67’s turn their attention to the Frotenancs. 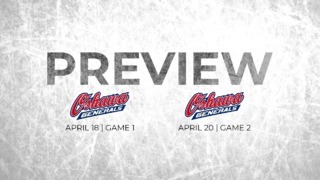 It is on an active five-game win streak that the Ottawa 67’s will be taking the ice on Wednesday night for a rare week-day home game, when they will be hosting the East Division last place Kingston Frontenacs. 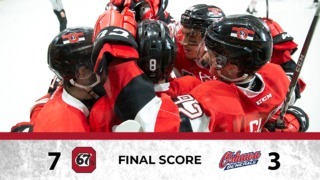 After winning a 9-6 goal fest on Friday in Oshawa, the 67’s went straight back home the very next day to face the Generals once again, in a much cleaner performance that saw Cedrick Andree shut the door for a 4-0 67’s win, in which the Orleans native made 38 saves. To close out the three-in-three weekend, the Barber Poles defeated a power house in the Western Conference, the Saginaw Spirit, by a score of 5-3. The most impressive part was that not only did Ottawa beat them on the last game of a three-in-three week end, but they did it against a very good team who did not have to play the night before. Among the biggest producers of the past week end for the 67’s were newcomers Kyle Maksimovich with seven points and Lucas Chiodo with six. Fitting in nicely centering a line between Maksimovich and Chiodo is Mitch Hoelscher, who was able to put up five points over the three game stretch. Tye Felhaber also stood out as he usually has been this season with a five-point weekend, but he will remember his goal against Oshawa that he scored on Saturday for a long time, as it was his 50th in 47 games. Sitting in second-last in the OHL overall standings, the Kingston Frontenacs are not hiding from anything: this is a transition year. After going for it all last year, the team had to re-load by trading away their better players for draft picks, including top players like Jason Robertson, who was traded to Niagara, and Jason Neumann, who was traded to Oshawa. The team has only won one of their last ten games, and Kingston is currently riding a five-game losing streak. Kingston has allowed 15 goals in their last three games, while only scoring one. Leading the Fronts offensively is Embrun native Ryan Cranford, who totals for 29 points this year. 17-year old Billy Constantinou, who was acquired from Niagara in the Robertson trade, is also a player to watch from the Frontenacs. Constantinou has already doubled his production from last season, as the puck moving defenseman has put up 25 point so far this season. So far this season, Ottawa has won all three of their contests against the Frontenacs and will look to make it four on Wednesday night. Having an impressive season with 51 goals in 48 games, the most impressive stat in Tye Felhaber’s season is the fact that the Pembroke native has scored in all of his team’s games this year except for ten. All season long, Felhaber has been held off the score sheet only five times. Austen Keating leads the OHL in assists with 53. Marco Rossi has been on fire recently. The Austrian forward is on an active six-game point streak, in which he has put up 7 goals and 3 assists for 10 points in his last 6 games. This game could get chippy, as both teams are amongst the top 10 in the league for most penalty minutes. Ottawa is second with 627 PIMS, while Kingston are 6th with 578 PIMS. This season, Ottawa has scored a total of 209 goals in 48 games while Kingston has scored 111 in 48.